(Note: after this story was published, the DNR sent out an expanded list of places to get the permits. The DNR press release is below the story). Deer hunters are getting a special chance in Oneida and Lincoln counties after the DNR announced special hunting permits beginning Thursday. "...We're sampling deer for CWD in two general areas this fall. One is in Harrison township in Lincoln county. The other is in Three Lakes in Oneida county. We will be issuing surveillance permits for public land in both of those sample areas..."
Mccullough says the permits will be available at the Merrill Ranger Station and the Rhinelander Service Center starting Thursday during business hours. The harvested deer must be available for CWD sampling, but he says that is the only extraordinary obligation a hunter would have...."
"..The tags are free and they're property specific . For example, they might be valid only for the Lincoln county forest, but no for some other property. They're going to be first-come, first-served. Hunters must pick them up in person and have their customer ID with them..."
Mccullough says the permits are valid until the end of all hunting in early January. So the hunter could use the extra permit for archery until the gun deer hunt, valid with a gun during that season, muzzloader season or the weapon that is used for that season. The DNR is referring to the effort as 'surveillance permits', an effort to get a high enough sample rate in affected counties so they can measure the impact of CWD on the local deer herd. MERRILL, Wis. – Targeted chronic wasting disease (CWD) surveillance will occur in two separate areas near Rhinelander this fall. Deer will be sampled in northern Lincoln, northern Langlade and southern Oneida counties following the detection of CWD in two wild deer along the Lincoln-Oneida county border. Deer in eastern Oneida, southern Vilas and western Forest counties will continue to be sampled as a result of CWD positive deer on an Oneida County captive deer hunting ranch, first detected in 2015. “Department of Natural Resources staff strongly encourage hunters to submit adult deer heads for testing from these areas. It is very important that we sample adult deer in these areas to gauge what is going on with this disease and to detect the infection early,” said Janet Brehm, DNR wildlife biologist. In addition to voluntary sampling in 2018, DNR staff will offer CWD surveillance permits to landowners within the Lincoln/Oneida wild positive area, as well as the area surrounding the captive deer positives in Three Lakes. CWD surveillance authorizations will also be available on select parcels of public land within these areas. CWD testing is a requirement for adult deer harvested with these surveillance permits. Private landowners should refer to the map below to determine if your land is in this area. Private land surveillance permits will be issued from the Rhinelander and Merrill DNR offices by appointment only. For Merrill, contact Carissa Freeh at 608-220-1817 or via email at carissa.freeh@Wisconsin.gov. Public land permits will be available at the Rhinelander DNR Service Center and Merrill DNR Ranger Station counters between 8:30AM and 4:00PM offices beginning November 8. For public land CWD surveillance authorizations, no appointment is needed. The DNR’s goal is to test 450 deer inside each Surveillance Area to determine range and infection rate for CWD. Hunters outside these surveillance areas can also have their adult deer tested at CWD sampling locations. Self-service kiosks are available to any hunter for CWD sampling. Simply follow the directions found at any kiosk, which includes removing the deer’s head (including a portion of neck) and completing a datasheet. Removing antlers does not affect test results. CWD sample submission is currently available at the following self-service kiosk locations: DNR Ranger Station, 101 Eagle Dr., Merrill; DNR Lemay Center, 518 W. Somo Ave, Tomahawk; DNR Service Center, 107 Sutliff Ave., Rhinelander; Norling Taxidermy, 6573 Ort Drive, Rhinelander DNR Service Center, 8770 CTY J, Woodruff; DNR Ranger Station, 1861 Hwy 45 N, Eagle River; Three Lakes Shell Station, 1742 Superior St., Three Lakes; DNR Ranger Station, 404 N Lake St., Crandon; Laona Shell Station, 4906 Hwy 8, Laona; The Corner Store, 497 Hwy 8, Armstrong Creek; The Fence Post, 603 Memory Lane, Fence; DNR Satellite Center, 223 E Steinfest Rd., Antigo; BP Gas Station, N9521 US Hwy 45, Summit Lake; Fisher’s Bar, N11209 State Hwy 17, Gleason; As well as the following Cooperators, if bringing the deer for processing: Geiss Meat Service, W4490 Pope Rd, Merrill; Lake Tomahawk Meat Market, 7259 Hwy 47, Lake Tomahawk; TJ’s Butcher Block, 8796 Hwy 51, Minocqua; Prime Choice Meat Market, 1144 US Hwy 45 S., Eagle River. DNR staff may add additional locations and are currently looking for cooperators to assist with CWD sampling. Visit dnr.wi.gov and search keywords “CWD sampling” for current sampling locations. For information regarding CWD test results, search keywords "CWD results.” To view CWD results for a harvested deer, hunters will need to enter a customer ID or CWD sample barcode number. CWD testing is free of charge to the hunter, and average turnaround time from when the deer is brought to a sampling station to when the results are available is typically two to three weeks. Self-sample kits available at Rhinelander and Antigo DNR service and satellite centers CWD self-sample testing kits are available at the Rhinelander DNR Service Center as well as the Antigo DNR Satellite Center. 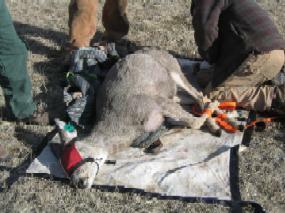 These kits include all supplies and instruction necessary for hunters to collect CWD lymph node samples from harvested deer, and a prepaid envelope for mailing samples to the DNR CWD Processing Center. These kits are free and are distributed on a first come, first served basis while supplies last. If test results come back positive for CWD, hunters should follow advice from the Center for Disease Control to not consume venison from that deer. Sick deer reports DNR staff are interested in reports of sick deer or deer with an unknown cause of death, but it is important to note that they are not currently examining car-killed deer. Contact your local DNR wildlife biologist to report a sick or dead deer or call the DNR’s Customer Service hotline at 1-800-847-9367. The DNR is hoping for a large hunter response to check on the prevalance of Chronic Wasting Disease in Lincoln, Forest and Oneida counties. Deer will be sampled in northern Lincoln, northern Langlade and southern Oneida counties and Forest county after the detection of CWD in two wild deer along the Oneida/Lincoln county line. Deer in eastern Oneida, southern Vilas and western Forest counties will continue to be sampled after a positive CWD-diagnosis on a captive deer farm in Three Lakes.